By Freeola Support on 15th April, 2019 | 2 Comment(s) | 1 out of 2 people found this article useful. Welcome to the Freeola Internet customer support pages. This guide is designed to help with setting up a Freeola email address﻿ on the standard mail application on an Android device. For more internet help topics please visit our main Support Page. Please be aware that different software versions may have slight differences in wording and layout, however you should be able to work out what goes where. To configure Freeola e-mail addresses on Android, you need to select the 'Email' button from the main menu and then press Next. From the list of account types, press the IMAP or POP3 button depending on the setting in your MyFreeola account (default is POP3)﻿﻿. You will now be asked for your E-mail Account information, the username field will be your e-mail address, the e-mail account password, the incoming e-mail server is yourdomainname.freeolamail.net where 'yourdomainname' is your domain name with any dots ( . ) replaced with hyphens ( - )﻿.﻿﻿ For example, if your domain name was freeola.co.uk, the incoming mail server would be freeola-co-uk.freeolamail.net. Authentication should be set to Normal Password. 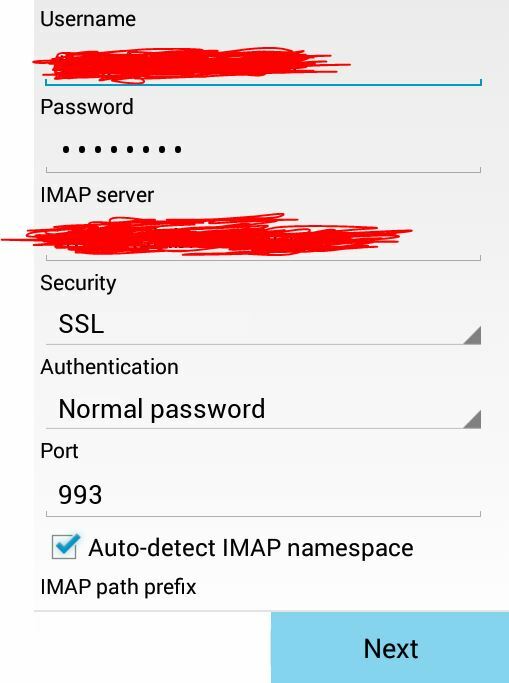 For a POP account, the port number should be 995 and IMAP accounts should be 993. The other options on this page are not necessary, when you are happy with your details press Next. If your details are correct, then you will be asked for your outgoing e-mail server details. This should be set to smtp.freeolamail.net. You will need to enable the option 'Require Sign In', and type your E-mail Address and password into the stated fields. Once you are happy with your details, press Next. Your Android device will now establish whether the details you have entered are correct, if they are you will be able to download your messages and send messages from your Freeola E-mail Address. This guide is designed for use with the standard Mail application that ships with the latest Android OS. While the settings displayed above are correct for any device using a Freeola address, they may need to be entered slightly differently for different software. Should you require assistance in setting up your account, please contact the Support Team on 01376 55 60 60 or via our online system found at https://secure.freeola.com/support/request/.